The colder weather has now arrived and it is a great time to travel to warmer climates. 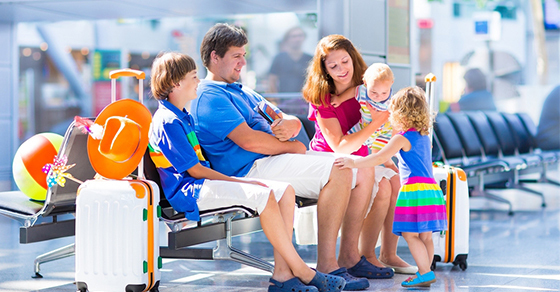 Vacations are a wonderful way to spend time with friends and family and relax, however, airports and plane travel can often be stressful and physically demanding. Here are a couple tips from Oakville Chiropractic to make your travels easy and help to you to arrive at your destination feeling healthy, refreshed and ready to go. Check heavy items and bags that are heavier than 10% of your body weight. For your carry-on, use a suitcase with wheels and a sturdy handle or a backpack to distribute the weight of the bag across both shoulders. Do not overload your carry-on. When lifting your baggage into the overhead bin stand directly in front of the compartment so not to twist or rotate your spine and bend your knees as you lift your bag. Traveling can cause us to remain still and confined so it is important not to stay in one position for too long or to stay seated for extended periods of time. Try to walk around the cabin or do some stretches every 30 minutes. Moving around increases your circulation and prevents swollen feet and ankles as well as tight and sore muscles. The more you move, the better you will feel when you land and begin your trip. Stretch your feet. Wear shoes that you can easily slip off so that you can make circles with ankles, as well as, point and flex your feet to increase the circulation and prevent blood from pooling in your feet and lower legs. Stretch your legs. Place your hands under your left thigh, keep your knee bent and draw your left leg towards your chest. Hold for 20-30 seconds and repeat on right side. Stretch your low back. Stretch your low back by leaning forward, allowing your belly to drop towards or in between your thighs. Release your head and hands towards the ground, and relax your neck, shoulders and arms. Stretch your arms and shoulders. Interlace your fingers with your palms facing away from you. Straighten your arms out in front of you at shoulder height. Hold for 20-30 seconds, repeat and release. Interlace your fingers again, straighten your arms and move them overhead, turning your palms upwards towards the top of the plane. Think of elongating your arms and your body as you feel a stretch through your arms, shoulders and the sides of your rib cage. Hold for 10-20 seconds and repeat. Stretch your neck. Gently stretch your neck in all directions; looking up, down, right, left and side to side, dropping your ear towards each shoulder. Hold each stretch for 20-30 seconds. Relieve tension in your neck and shoulders by raising your shoulders up towards your ears, holding for 3-5 seconds and relaxing your shoulders down into their normal position. Repeat this shoulder raise 2-3 times. The air on airplanes is recirculated and often has a humidity of less than 20 percent. Dehydration can lead to headaches, stiffness and pain. Be sure to stay well hydrated by drinking plenty of water or low sugar beverages. Stay clear of caffeine and alcohol which will further dehydrate you. Use the bathroom. It is an excuse to get up and walk round. You can also stretch in the bathroom if there is room. Booking and receiving an adjustment shortly before leaving will also help you be in peak physical condition for your travels. If you have any questions or would like more information please feel free to contact us at and book a free, no obligation consultation. Call us at 905-845-2291 or send us an email info@oakvilechiropractic.com!